Today is a very exciting day in blog land, because the doors for Elite Blog Academy 3.0 are now open for registration! EBA opens for enrollment only once a year and ONLY FOR 5 DAYS! So if you are a blogger or have even just thought about blogging, this is a course you will not want to miss! I know I told you about my own personal experience about Elite Blog Academy when I decided to take it last year. I can’t tell you enough how much it changed my whole approach in my blogging business. I’m still blown away with all the valuable information and lessons I got from this epic course, and I am slowly but surely implementing them in my business right now. I’m happy to say that I am getting to where I want to be in terms of my blog traffic and income growth! Question #1: Who is Elite Blog Academy for? I will be the first to admit that EBA not right for everyone. Elite Blog Academy was created for bloggers and online business owners (or those who aspire to be) who want to know exactly what steps they need to take to create a successful, profitable blog, and who are willing to actually take those steps. If you are not interested in doing the work, then I don’t want you taking the course because the value comes from what you put in. Perhaps you’ve been blogging for a while but don’t feel like you’ve quite figured out the formula just yet. You know you’re missing some critical piece of the puzzle, but you can’t quite figure out what it is. EBA will show you, step by step, exactly what you need to do to step up your game and find the success you’ve been looking for. You’re well past the intermediate stage, yet somehow you feel like you’re still missing critical opportunities for traffic and revenue growth. You want to create a deeper connection with your audience, and build a sustainable long-term business. EBA can help you take your business to the next level and transform your mindset from that of a blogger to that of an entrepreneur. EBA provides a comprehensive framework for success, and a step-by-step plan for you to follow, but you will still need to do the work to get it done. Question #2: How much does Elite Blog Academy cost? It never ceases to amaze me how many people are afraid to invest in themselves and their potential. And maybe you’re feeling that way too. You might be worried that you won’t get your money’s worth, or that the content won’t be anything you haven’t already heard before. Deep down, though, there is probably a deeper fear—the fear that you’re not worth it, or that you might fail. But here’s the thing—over the last four years, I have worked really, really hard to create a course that has the potential to transform not just your blog, but your whole life. What do you wish you had started a year ago? Do you really want to feel that way a year from now? That is exactly what EBA does—it gives you a comprehensive and proven framework for creating your own success. If you do the work, you will see results, which is why the course comes with a 100% guarantee. And while a course of this scope and magnitude would normally be priced at $2,000 or more, I wanted to make sure it was affordable enough for anyone who is ready to put in the work. That’s why EBA 3.0 is available a one-time payment of just $797 or 3 monthly payments of $297. When you put it into context, it’s pretty amazing to consider that our tuition is less than you would pay for one semester at a community college, or even just one class at a 4-year university, and yet this course has the power to change your whole future. So if you are interested in Elite Blog Academy, but have questions about it before you make a decision, you can tune into an awesome FREE LIVE training with EBA’s creator Ruth Soukup this Thursday, March 2nd at 4:00 pm EST. Now, there are only 500 seats for LIVE attendees, so get there early and secure your spot if you have questions you want to ask Ruth about this course. Ruth will also offer a replay of her live training that will only be available for 24 hours. So if you can’t watch it live, that’s okay, but be sure to watch the replay right away! Another thing, Elite Blog Academy comes with a 100% money-back guarantee. So if after completing the course and followed the guidelines, and you still have not seen measurable results in your traffic and income growth, you will receive your money back in full, no questions asked. This means you literally have nothing to lose. Question #3: What do you get from Elite Blog Academy 3.0 2017 course? When you secure your spot for the Elite Blog Academy 3.0 course, you will not only have access to awesome products, you’ll also get a access to a supportive community and so much helpful resources you need to ensure your blogging success! Get access to the full EBA 3.0 course curriculum, including all 12 unit videos + unit workbooks, which will give you a comprehensive blueprint for creating a successful, profitable blog. Get 36 purposeful assignments that will help you take immediate action and actually apply the lessons you are learning to your own blogging business. Get access to our private EBA Facebook Community were you can connect daily with other elite bloggers & online business owners and get feedback and accountability. Get ongoing support and encouragement in your blogging journey, including weekly emails, monthly Live Q&A sessions, and access to our entire EBA support team. Get more than $1,000 in additional EBA and partner bonuses, including our Ultimate Resource Guide, Social Media Strategy Guide, and much, much more. Get lifetime access to all future course updates. Get all the tools you need to create your successful, profitable blog. Our comprehensive framework provides a step-by-step plan, while the course materials are designed to explain each step in detail. From here on out, you’ll never wonder what your next step should be. Get a 100% Satisfaction Guarantee. If you complete all the course assignments and do not feel we delivered, you can request a full refund, no questions asked. Awesome BONUSES if you enroll in EBA – today and tomorrow only! 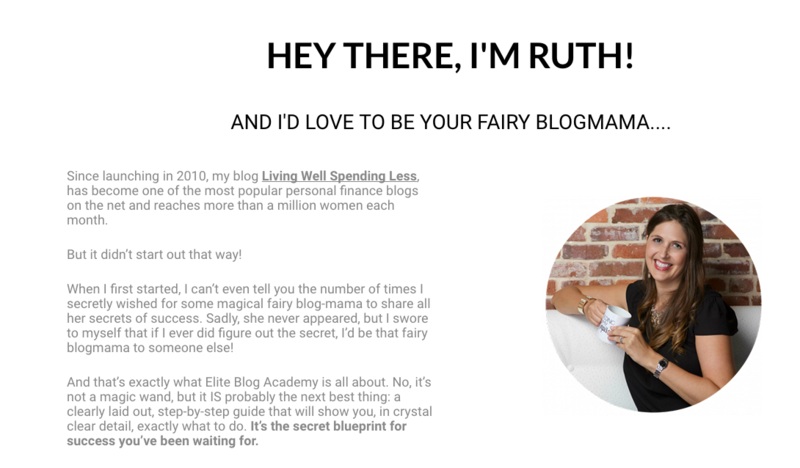 It is only available for people who enroll in Elite Blog Academy today or tomorrow, and it is something that Ruth has never offered before. It’s called The EBA Product Launch Playbook, and while it is not yet available to the public, Ruth has this aside as a special bonus exclusively for people who decide to enroll in Elite Blog Academy 3.0 course today or tomorrow only, Feb 27th and 28th. The EBA Product Launch Playbook is a game changer! Because let’s face it–the logistics of creating momentum and getting your book or product can be pretty daunting sometimes, but it doesn’t have to be. 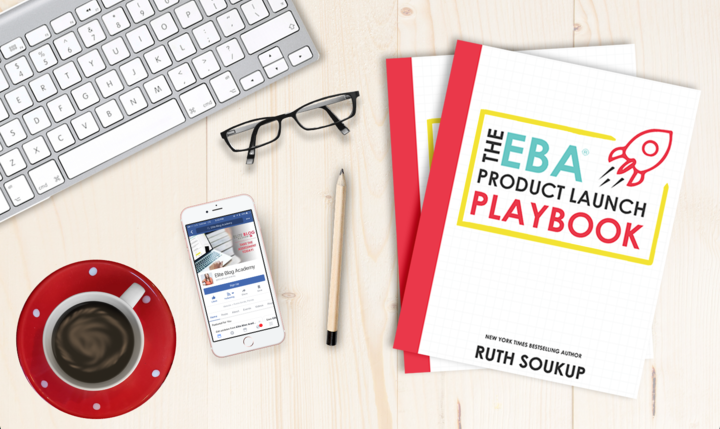 The EBA Product Launch Playbook will show you everything you need to know, from establishing your timeline and priming your audience, to crafting powerful sales copy and actually driving sales. With the EBA Product Launch Playbook in hand, you’ll never again wonder how to get your product or affiliate promotion off the ground. Discover the five powerful sales secrets that will forever change the way you look at marketing. Master the seven simple rules for launching a product and double your sales revenue overnight. Create an effective timeline that delivers your message with the maximum impact. Learn how to grow and prime your list of prospective customers so that they can’t wait to buy. Perfect the art of sales without selling through stellar copy that speaks directly to the heart and mind of your customer. Convert your prospects into paying customers through proven strategies that actually make them like you more, not less. Use our fill-in-the blank launch template to effortlessly plan every aspect of your first launch from start to finish. This EBA Product Launch Playbook features detailed launch plan information that you won’t find anywhere else, including samples from 4 real-life launches that totaled over $1 million in sales! 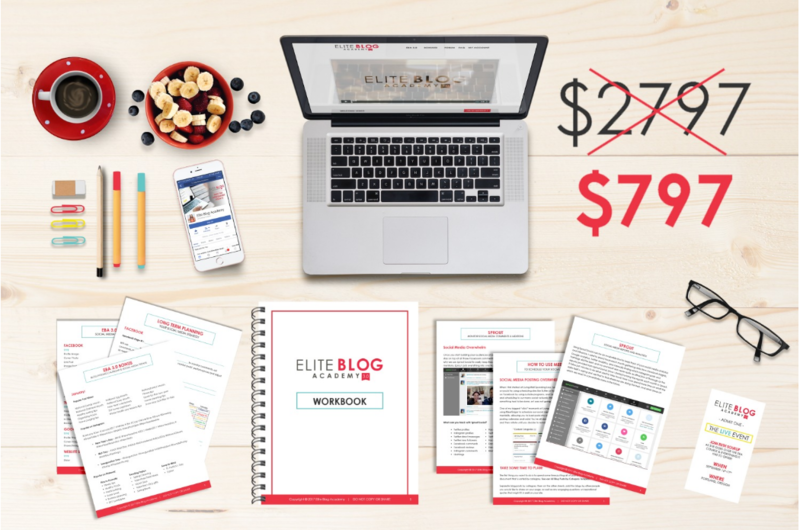 It is a $297 value all on its own, but right now it is only available to those who raise their hands and enroll in Elite Blog Academy before 11:59pm tomorrow, February 28th. Are you still really going to wait? You could wait another year before enrollment for EBA opens up again, but that is a lot of time to lose! And if you’re still on the fence about it, go here to see success stories of other bloggers who are now making full-time income with their blogs following the lessons and guides from this course! What if, a year from now, you were able to earn a full time income from your blog? What if you could work from anywhere and have the life you’ve always dreamed of? How would your life be different? Seize the opportunity to begin your blog transformation right now. With a 100% guarantee, there is nothing to lose but everything to gain! I am rooting for your blogging success! This looks like a great academy for bloggers trying to grow. If they are willing to invest in themselves I am sure they will learn a lot. I’ve heard nothing but great things about this course! I’m going to have to check it out! I’ve heard such great things about the Elite Blog Academy. There’s always room to grow, so this sounds like a great option for anyone. I have heard this course is super useful. Anyone can always learn something new! There are so many options for bloggers to continually learn. I’ve taken paid classes and free ones and I’ve gained something from all of them! Thank you so much for sharing- I am definitely going to look into this course to take my blogging business to the next level! Thank you so much for putting this on my radar! very interesting topic. its worth reading article! gonna share this to my bff! I’ve never heard of this course. I agree with everyone, we have to stay educated in our craft. I’m so glad I read your post! This is absolutely amazing! A great help especially for newbie bloggers! This is awesome! Such a great help for bloggers and businesses! This sounds great. I may need to look more in to this. I have some friends that are interested in starting up with blogging so I may need to show this to them. Looks like a wise investment right there. This elearning course would really help those who are barely starting out on blogging. I am sure this EBA would provide all the tools and know how for every newbie to succeed in the blogging world. I love that there is so much great info out there, especially with easy access. This is a great tool for those wanting to take the leap and create an amazing blog. “I want to create a deeper connection with my audience, and build a sustainable long-term business. “. I am excited for EBA to help take my business to the next level and transform my mindset from that of a blogger to that of an entrepreneur. I feel that I was fortunate enough to make some good friends early on in my blogging career that helped me figure out the blogasphere. I wish a course like this had been around back then. I would love to check this out. I am always looking to learn more about blogging. This is a great resource for my Sister. She is just starting out with her blog. I will have to share this with her. I am sure we all could use some helpful refreshers, and guidance. This does seem like a very helpful course. This sounds like a really great course to take. I don’t have the time to do it this year but maybe next year. What a great resource and there is always something new to learn. I think I will sign up for the free live training to get more information. This sounds great for people who are wanting to learn to make more money with their blog. I’ll be sure to check it out. Always looking for ways to improve. Thanks for the info. That is fantastic! If you’re just starting, it can be hard to know what to do. If you’ve been in the game for a while, it never hurts to have more info. Thanks for the info. I have been looking for some new courses to take.